First of all rule out obliquity and improper alignment of pt's head during scanning, the major source of error during assessment of asymmetry of lateral ventricle and cerebral hemispheres. Next is grading of asymmetry, as mild moderate and severe. 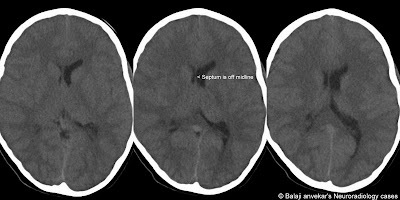 Mild asymmetry is usually seen secondary to off midline septum pellucidum, where rest of the lateral ventricle and its horns are symmetrical, normal and non dilated. Adjacent basal ganglia show normal volume and density. Prevalence of mild asymmetry of lateral ventricle in our routine opd work load is approximately 5 percent. Headache was the most common symptom in pt with asymmetry of lateral ventricle and were treated conservatively. Seizures was the second common complaint in this group. Giddiness and neuropsychiatric problems like schizophrenia in few. Widening of left lateral ventricle is more common that right. No obvious association found between asymmetry of lateral ventricle with right or left handedness. To pass if off as normal finding or variant, it should be an isolated finding, without any obvious cause like volume loss due to an adjacent basal ganglionic gliosis or atrophy, without any intra ventricular or para ventricular space occupying lesion, without any trapping lateral ventricular secondary ependymal adhesions. It is important to differentiate between moderate and severe asymmetry of lateral ventricle from unilateral hydrocephalus which is done by using three different ventricle to brain ratios (V/B ratios). Mild asymmetry in lateral ventricle can be passed off as a normal anatomical variation if not associated with any intra ventricular or adjacent parenchymal abnormality; at the most make a note of finding in the report. Moderate and severe degree of asymmetry of lateral ventricle should not be overlooked, search for possible accompanying pathology or association with cognitive disorders. Sir i took my ct scan and i have mild asymmetry of lateral ventricles seen R>L. before i took ct scan. i experienced a small problem. i tried to write some numbers i found i could not write it properly or clearly my hand did not cooperate. Rest i was fine and everything was normal. Also i keep getting pains in my thighs at different times but only for one minute or so. What can be my real problem. Please help me. In this case the left lateral ventricle appears larger than the right, in the posterior body region also, not only at the frontal horn level. So is it OK to suggest this as essentially a normal variant? My MRI scan shows, asymmetric prominence of left ventricle, this could be a normal variation. But, I'm feeling tirednes, foggy brain under lights,slight uneasiness in left part of head. I have left lateral ventricle slightly prominant than right. And i yhink i have obssesive compulsive disorder. Is there any corelation between these two ? Also is there any chances of glioma or other tumour condition with alv ? I had an MRI of my brain done and I have mild congenital lateral ventricular asymmetry. Accompanied with bilateral dilated perivascular spaces. A cyst on my pineal gland. Partially empty sella and left concha bullosa. Should I be concerned? I have asymmetry of the right ventricle which my neurologist thinks is congenital. However when I was about ten years old I suffered severe head trauma, fractured skull, concussion and spinal damage to my C4 and L5 of my spine. This was the result of a diving accident where I slipped off a person's shoulder and plunged head first into the water. It was a straight hit, not diagonal. I'm sure the assume try is a result of that accident and not congenital. What should I do? Damage can't be reversed. Neuro tests were carried out and the results suggested poor effort even though I put all my efforts into the testing. Basically, the tester didn't believe I made an effort and dismissed the results of the testing, resulting in a non approval of disability compensation. Sir, i took my mri and reports say everything else is normal but i have mild asymmetrical lateral ventricles (right > left). I feel throbbing pain in my head and some kind of painful currents flowing from the back side of head directing towards forehead. I usually get my blood pressure abruptly high, somewhere around 140/120 every now and then. It sometimes feels like something is piercing right into my head. That time i get goosebumps all over my body. I have been on anti-depressants since age 5. Sir please help me fix my problems. I really need your attention.Hopefully waiting for your reply. Sir i took mri scan and the reports say everything else is normal but i have mild asymmetrical lateral ventricles R>L. i feel throbbing pain in my head and seizures sometimes. I got my epileptic spells normal. I have blood pressure issues. A doctor concluded that i am suffering from hypertension grade - II. I am on anti-depressants since age 5 or 6. And now i feel like my body is malfunctioning. Sir please help me fix it. Hopefully waiting fro your reply.